Throughout the year salt marshes exhibit cycles of birth, growth, and death. That may be most obvious when looking at the plants, but it also applies to animals, bacteria, and fungi, sometimes on longer and sometimes on shorter time scales. Since marshes are such productive ecosystems, what happens to all of that organic matter when something dies, be it a leaf, single-celled organism, or alligator? 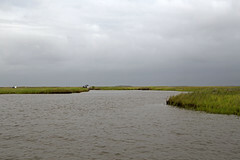 Detrivores are an important part of the marsh ecosystem, breaking down organic matter and cycling nutrients; in fact, in salt marshes, detrivores are the dominant consumers. Most decaying plant matter in a salt marsh is consumed by bacteria and fungi, which are then food for larger creatures, but a host of species in the salt marsh are detrivores: snails, crabs, amphipods, nematodes, fish, and many others. Some of these, like fiddler crabs, feed by finding pieces of detritus on grains of sand and soil, while others specialize on a particular species’ remains. Gammarus palustris is an amphipod which consumes the dead leaves from salt marsh cordgrass (Spartina alterniflora). Zimmer et al. (2004) suggested a variety of detrivores were needed in any habitat type for efficient decomposition and that you couldn’t substitute one species for another- the different species contribute in different ways. Whether big or small, detrivores keep nutrients moving within the system and prevent dead organic matter from building up, and that helps salt marshes continue to be so productive. Zimmer, M, Pennings, SC, Buck, TL and TH Carefoot. 2004. Salt marsh litter and detrivores: a closer look at redundancy. Estuaries 27: 753-769.